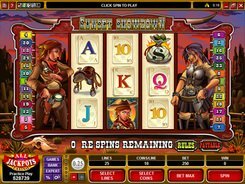 Sunset Showdown is a Wild West-themed slot with 5 reels and 25 paylines. 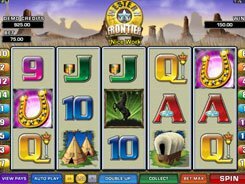 On the reels you will see money bags, saddles, spurred boots, revolvers, cowboys, cowgirls and playing card symbols from Nine to Ace. 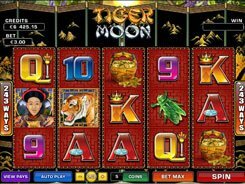 The maximum bet is 250 coins, and a coin size is adjusted from $0.01 to $0.25, therefore the top bet reaches $62.5 per spin. 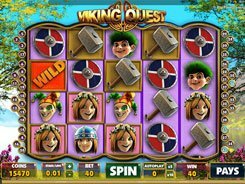 The Cowgirl which is a wild pays out the top jackpot prize of 7500 coins for five of a kind. The wild substitutes for other regular images and is also a feature-triggering symbol. When landed on reels 1 and 5 at a time, the wilds expand across the length of the reels. The remaining reels will then automatically spin 3 times at no cost for you. 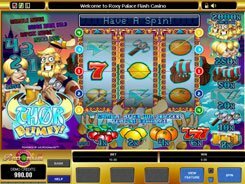 There is another bonus game named the Baddy Feature triggered by three or more Revolver symbols scattered on the screen. You will be taken to a new window and will see a cowgirl armed with two guns. You are to shoot five bad guys, with a random award paid out for each guy shot. 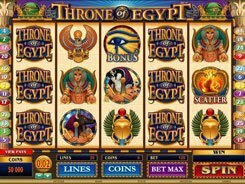 After any winning round you can opt to try to increase your win x2 or x4 times by playing the Gamble feature. PLAY FOR REAL MONEY!